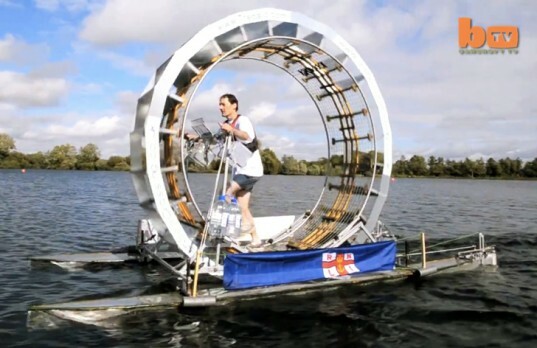 Man Makes Giant Hamster Wheel To Walk Across The Irish Sea | OhGizmo! By David Ponce on 10/11/12 • Leave a comment! Why sail when you can paddle, and why paddle when you can walk? Isn’t that the proverb? No? Well, it should be if you’re going to pull a cool watery stunt, like Chris Todd here. He built the contraption you see above and called it the Treadalo. It’s a human-sized hamster wheel fused to a catamaran hull, and is propelled by a walking human. We think the name is a play on the word “pedalo.” We like pun-y names like that. And we like that he thought he could use it to walk across the 66 miles that separates Wales from Ireland. Chris believed he’d do the trek in two days and actually got halfway there before he was done in by waves that were too big for the vessel to handle. He was forced to tow the Treadalo back to Wales with a rescue boat and the thing broke on the way back. It’s sad because Chris wasn’t doing this just for fun: he was trying to raise money for charity. But a broken Treadalo is not failure, merely a setback. The man is already working on making a second attempt later this month. ← Why Should Grown Ups Have All The Fun? There’s A Jacuzzi For Babies Too!